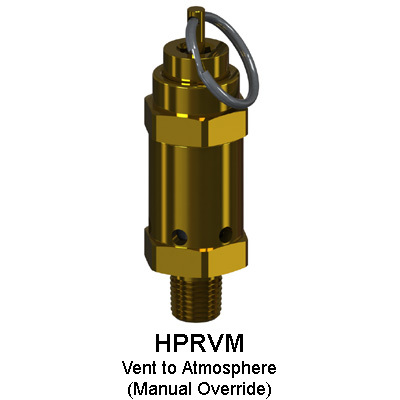 The HPRV Series Relief Valve provides accurate crack pressure with zero leakage up to 98% of nominal set pressure. When properly specified, this factory preset, tamper proof design, is ideally suited for most any liquid or gas application. Encapsulating the o-ring seal within the poppet eliminates seal extrusion and cold flow characteristics. By guiding the poppet into the body, a line of contact seal is ensured and at high crack pressure settings, the o-ring is protected by a metal-to-metal stop between the poppet and the body. High flow design, combined with narrow band interchangeable springs, minimizes system pressure rise as flow demand increases. 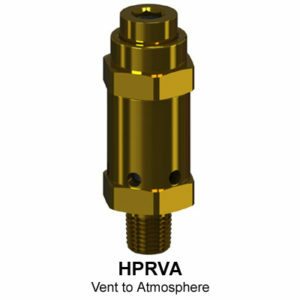 Available in brass or stainless steel and inline or discharge to atmosphere. 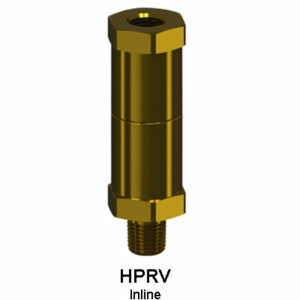 Valves can be supplied with a manual pull ring override.